Yikes, 2 weeks left and a lot to do. 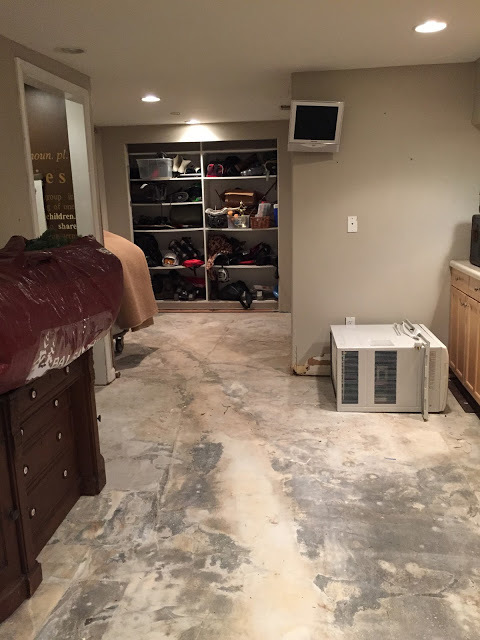 The start of our basement which is getting turned into a giant mud room and a place for all our sports equipment. So week 1 was all about the inspiration. Week 2 was all about product selection. Week 3 I made a little progress in the turning the closet into a reading nook. I also planked half of the walls and the stairwell as well as add a rug runner. Now we are on week 4 and there is lots to do. Here is what I accomplished this past week. I added books to the reading area, and got the bench top made to accommodate the new cushion from Tonic Living. I also hung two lights to either side of the nook. I love this area so much better now. Turning closets into nooks is one of my favorite things to do. Now for the not so pretty side of the room. The plan for next week is to finish planking the walls and paint them. To the right of the French doors there is an under the stairs alcove. It will serve as a large "dog kennel" if you will. I am having a custom gate made for it and the plan was to wallpaper it, but after finding out the wallpaper would be almost $400.00, I will be planking it too. I need to clean out the large walk in closet and add shelving for sports equipment, I know I keep saying this, but we have a ton of gear. I will be painting the doors black and my husband is supposed to be building me some cubbies on top of the cabinets. In the end I hope this room will not only be cute, but also super functional. We need all the storage we can get in our small house. Hopefully by next week the cubbies will be built, the walls will be planked, and everything painted! 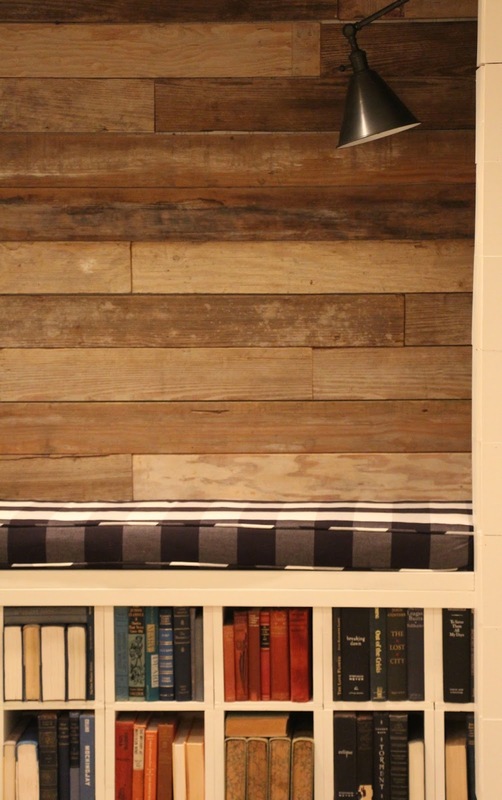 Love the reading nook! 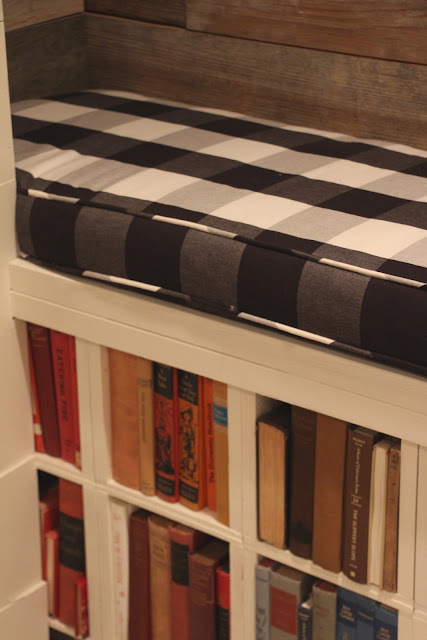 The planked wall, the buffalo check cushion! I'm excited to see what you have planned for the other side of the room! I'm excited for you! Can't wait to see what you have planned. The nook came out great Melaine! I love the wood, cubbies and that gorgeous thick cushion! That bench area is so cute! Love the plaid against the wood planking. Looking great!!!!! Love the bench and reading nook! Love that bench fabric! Great nook. You can't go wrong with planks and the dogs won't ruin them! It is looking fabulous! I really enjoy your blog but I wonder why you'd have a dog kennel in the basement - since dogs are pack animals they typically want to be where their family is . I get that people need places for their dogs but I don't get putting them in the basement where no matter how much work is done to make it nice no one ever really wants to hang out. I see lonely dogs under the stairs - but maybe I'm missing something ! I will also tell my friends to seek help from this blogI am really looking forward to more great informative pages and services.